The latest 3D Printer has arrived in the United States! New article on Founder Enrico Dini in Post Magazine! If you missed The Realities of 3D Printing, our March 30 special event here at BuiltWorlds, you actually missed a lot. In fact, you missed the future of BuiltWorlds, and by that I mean the dawn of “live streaming” our thought-provoking shows on compelling issues pushing this industry and your business and this industry further and faster than many of us ever thought possible. That new “live streaming” era for us (and you) continues now with the BuiltWorlds CEO Tech Forum 2016, which continues to unfold, captivate, and engage even as I type this. Incredible Bridge Produced by Founder, Enrico Dini for IAAC! Here is Enrico pictured celebrating on the 3D printed bridge, produced by D-Shape technology. Enrico, the majority shareholder of D-Shape Enterprises as Monolite UK Ltd., has always considered infrastructure and exterior landscaping markets to be a prime candidate for early market adoption of this incredible technology. The Bridge here was 3D printed and produced in Europe. A collaboration between the Institute for Advanced Architecture of Catalonia (IAAC) in Barcelona, Spain, and ACCIONA, a company dedicated to Spain’s sustainable infrastructure, have pipped other bridge innovators to the post by installing the first 3D printed bridge in a park south of Madrid. In an exclusive interview with 3DPI, the IAAC design team revealed some of the secrets behind 3D printing the Alcobendas bridge, and share great promise for the future of 3D printed architecture. Please support 3D printing technology development and vote for our Kushner Studios upstate NY construction project! Our project is a finalist in the Architizer A+ Awards for the Plus Categories | Concepts: Architecture +3D Printing category! Voting ends March 1st, 2016. Thank you! CEO James Wolff will be making a special appearance at the March 30, 2016 Built Worlds conference hosted by Autodesk and Northwestern University. D Shape from SpaceWorkBench on Vimeo. 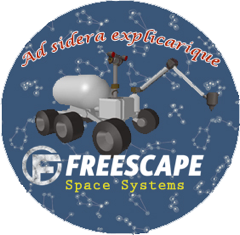 Freescape is the space systems d/b/a wing of D-Shape Enterprises. 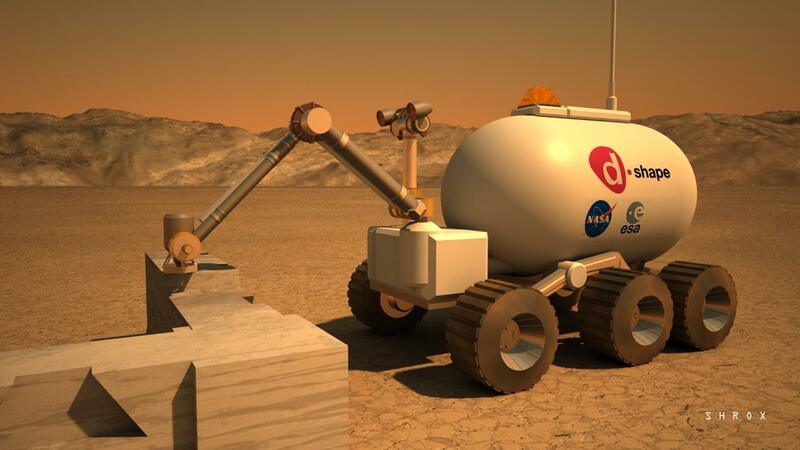 We are actively developing a mobile rover with 3d printer turret for space operations. We are coordinating with the European Space Agency for the development of their Farside Lunar Mission Architecture. Our goal is to produce a working scaled prototype by the end of 2015. It is my great honor to debut these two new renderings from the next-generation mobile multi-purpose 3D printer system being developed by D-Shape Enterprises LLC for residential construction, infrastructure, DOD military, and NASA space applications. The artwork is produced by Lead Designer Douglas Shrock, a brilliant artist with a world class portfolio of artwork. 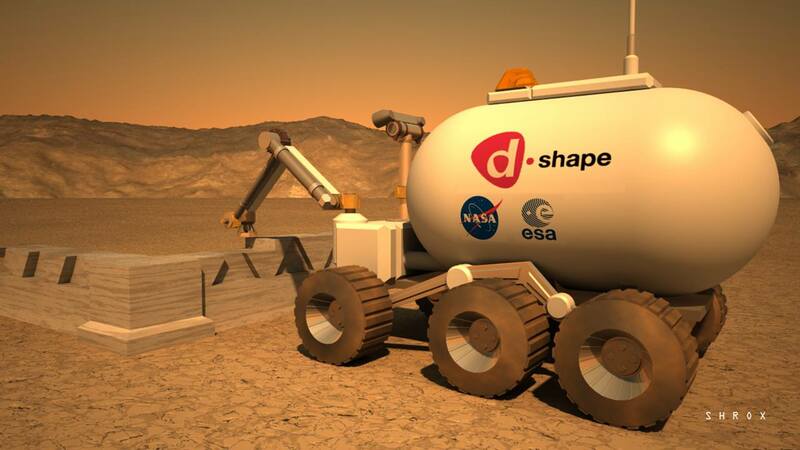 This represents a new day for D-Shape, as we begin to stake out our leadership in the emerging industry of mobile rover fabrication systems. Stay tuned, as NY World Makerfaire approaches for more artwork, renderings, and videos. Share with your friends, and google Shrox to view and purchase his amazing artwork. I truly believe it is a good investment and they will all be collectors items someday in our far future digital worlds. Greetings and welcome to D-Shape Enterprises. We are a global mega-scale concrete and metals 3D printing company revolutionizing the construction industry through partially-autonomous advanced printing, welding, and excavation machine systems. Our applications include landscaping, bridge walkways, artificial coral reefs, home and outdoor furniture, interior design panels, single-story construction, water fountains, modular pools, and more. Browse our site for interesting articles on our current projects, for information on purchasing one of our systems, or if you are interested in commissioning a home remodeling or your next dream house. The future is here, D-Shape Enterprises will change the world. Greetings and welcome to D-Shape Enterprises. We are a global mega-scale concrete and metals 3D printing company revolutionizing the construction industry through partially-autonomous advanced printing, welding, and excavation machine systems. Our applications include landscaping, artificial coral reefs, home and outdoor furniture, interior design panels, single-story construction, water fountains, modular pools, and more. Browse our site for interesting articles on our current projects, for information on purchasing one of our systems, or if you are interested in commissioning a home remodeling or your next dream house. The future is here, D-Shape Enterprises will change the world.